It's been a busy wedding season for Prince William and Prince Harry. Earlier this summer they were the star guests at Guy Pelly's wedding, last month they reveled with longtime friend Charlie Gilkes at his Italian nuptials, and just two days ago, the brothers reunited with childhood friend Victoria Inskip and her fiancé Robert Davies-Jones for their big day! Noticeably absent from the festivities was pregnant Kate Middleton, who is still said to be suffering from acute morning sickness. Harry's rumored on-again girlfriend Cressida Bonas was also missing. Last week reports surfaced that Harry and Cressida had reunited for the prince's 30th birthday. They were also spotted at a movie theater near Kensington Palace catching a movie. Ultimately, the two ladies weren't really missed at the wedding. According to the Daily Mail, the royals used their solo outing as an opportunity to reunite the "Glosse Posse" — the reported name for Harry and William's circle of friends, which included Pelly and Inskip, when growing up at Highgrove House, the Gloucestershire home of Prince Charles. Hopefully the royal brothers kept their partying in check without Kate's presence. The last time the duo attended a wedding with friends, Prince William reportedly lost part of his tooth! According to the Daily Mail, William and Harry went to the wedding of friends Tom van Straubenzee and Lady Melissa Percy last June while Kate was home, pregnant with Prince George. "William was dancing into the small hours when Tom knocked the tooth out on the dance floor," a source says. "William was joking that if Kate went into labour that night, he'd have to smile for the cameras with a missing tooth." What kind of reception is appropriate? 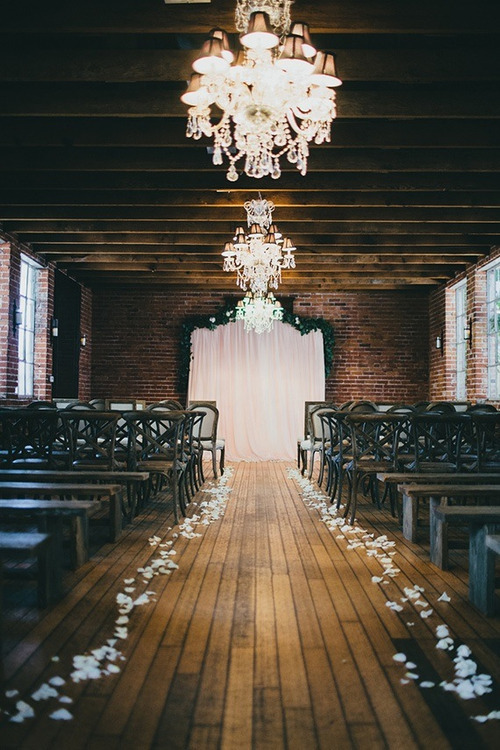 If no wedding reception was held or if only a small reception was held, this celebration may include all the components of any wedding reception. It can be as formal or as informal as the couple wants. 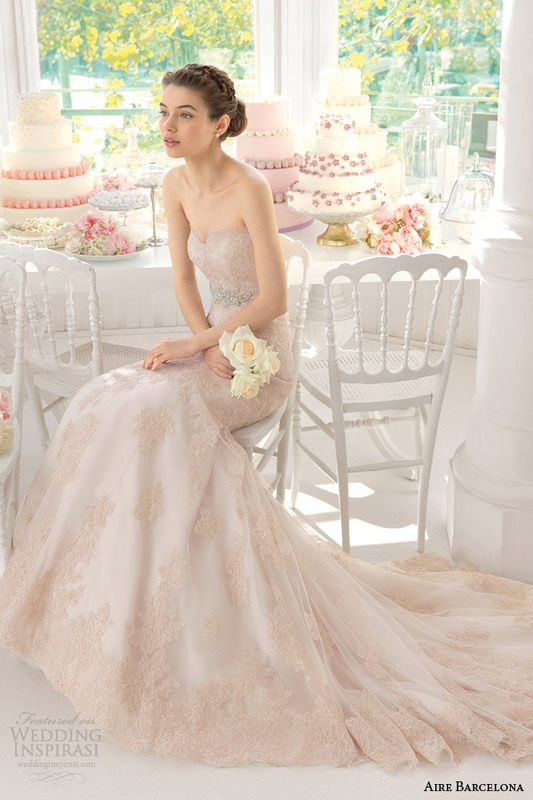 If the bride wore a wedding gown for the ceremony, she may wear it again at the reception party if she wishes. They can even have a wedding cake ready to be cut and served to guests. No gifts are expected. However, some guests choose to bring gifts. The couple should open any gifts they do receive after the party and send prompt thank-you notes. How do I word the invitation? Summer is the time for weddings and there's a 90 percent chance that we all attended one before the season came to a close. Well, that begs the question: Why not get married in the fall? The weather is beautiful (and tolerable), the leaves are changing colors, vendors are less busy, and everyone is in the festive spirit right before the holidays. We tapped the thoughts of the Manager of Catering and Sales at New York City landmark venue The India House, Grace Lui on the five pros of an autumn celebration. Fall foliage makes everything look magical. Though blooming, fresh flowers are hard to resist, they're no match for the richly-hued leaves of fall. Of the season's backdrop, Lui says, "If you're in an outdoor space with autumn foliage, the warm orange, reds and yellows will definitely make every image pop." The summer heat is behind you which means the partying possibilities are endless. Outdoor weddings can become quite sticky due to the balmy weather, but none of that matters for autumn as the weather is more temperate. This means your guests will hit the dance floor and party until they drop without worrying about the heat and humidity getting the best of them. It's the perfect time of year for a long-sleeve gown or a bit of fur thrown in the mix. "Wedding trends have been moving in the vintage direction for some time but even for the most modern bride, the colder season definitely calls for a more romantic feel for a bridal silhouette", says Lui. 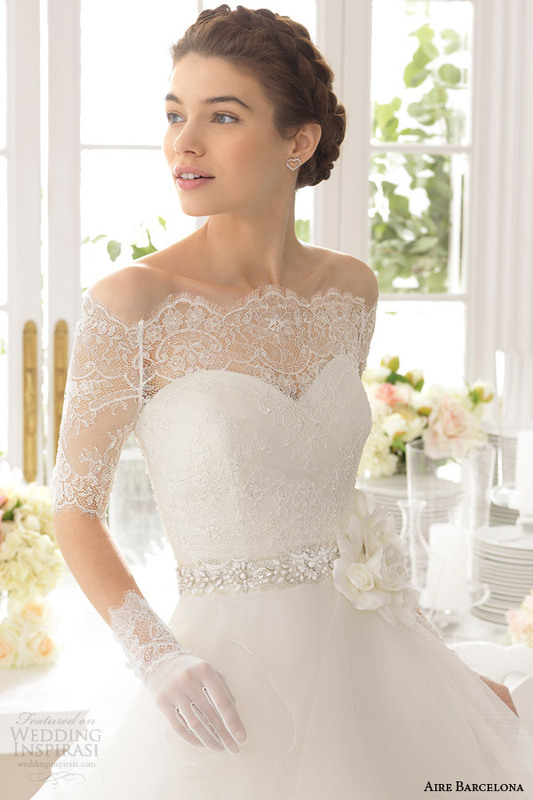 She adds, "The elegant sleeved and lace style is more popular in the fall partially due to cooler temperatures, but also because it is complemented by the lush elements of décor often woven through the wedding design and theme. 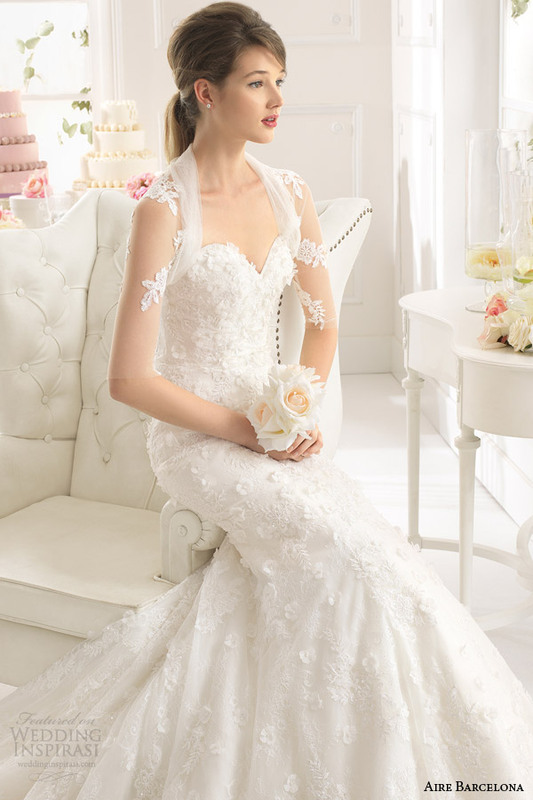 Elegant wedding gowns are often paired with a stylish fur or cape. Also, boutonnieres with berries and maple leaves create a burst of color on a crisp gray suit." A lot of fun can be had with décor that simply doesn't fit the spring or summer months. Autumn has its own special brand of seasonally-special details. "You can have a lot of fun in a fall wedding with props and décor that may not match the summer months like centerpieces with strings of pearls, gold mercury glass candles, pumpkins and berries," states Lui. "Pumpkins, gourds and bronze-colored lamps give the space an amber glow." Warm drinks and holiday-inspired pies can be served to your guests' delight. "Signature cocktails like Spiced Rum Apple Cider and Old Fashioned can be featured as the bride and groom's choice", suggests Lui. "Bisques and pies are often selected for their warm sense of familiarity, too." Are you throwing a fall wedding? Let us know by tweeting us @BRIDES! How’s this for a pretty start to the week? 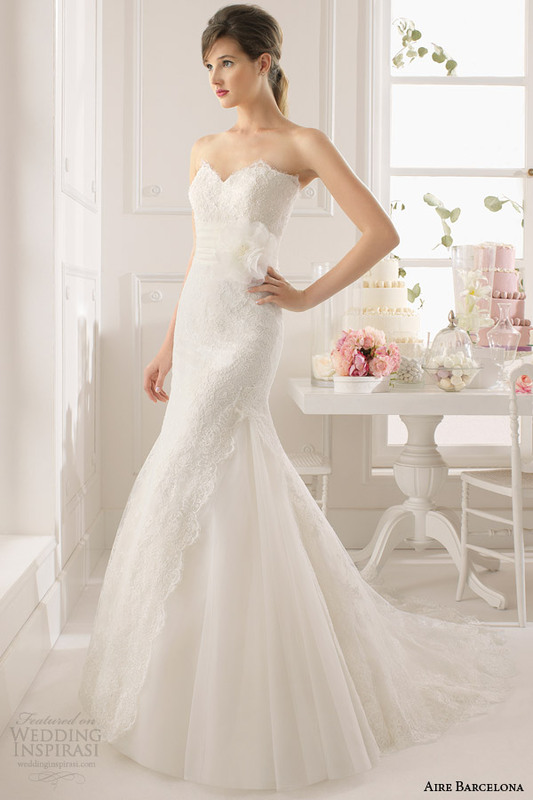 As you may know, we here at Wedding Inspirasi have an ongoing love affair with Aire Barcelona wedding dresses. They have such an elegant, timeless quality about them, and ooh, have you seen the latest collection? It is simply breathtaking! Today you’re in for a treat because we’ve rounded up some of our favorite strapless styles from Aire Barcelona’s 2015 collection. 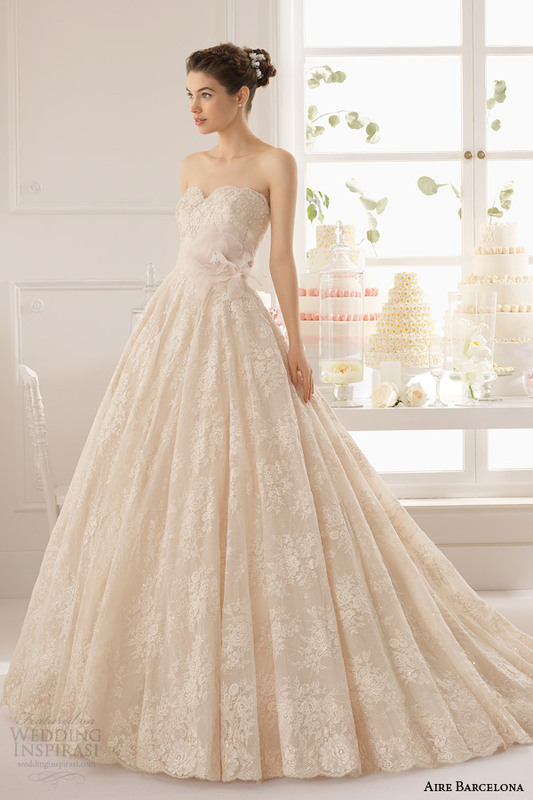 This collection includes some super gorgeous colored bridal gowns (shown here is the stunning Azuzena strapless champagne lace ball gown). 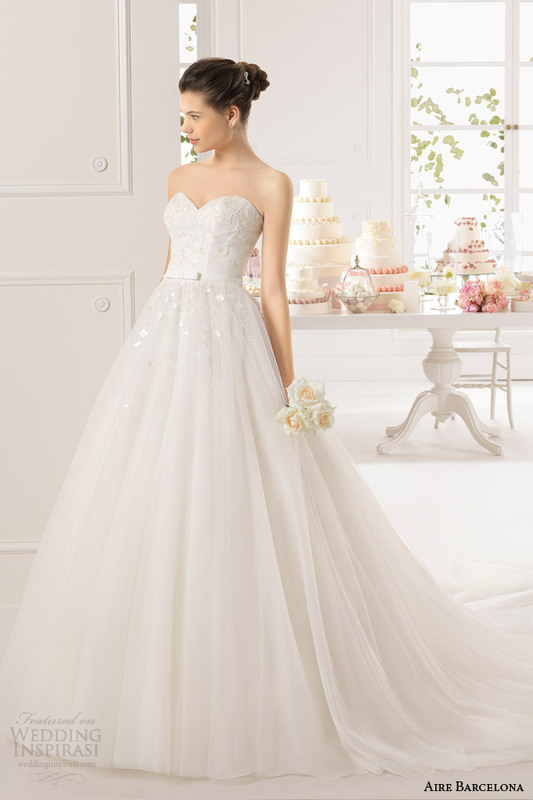 More gorgeous Aire Barcelona wedding gowns on the next page. Contrary to popular belief, cold feet aren't the only cause of pre-wedding jitters. In fact, most of the time brides couldn't be more excited to marry their significant others. It's the things that are truly out of their control that often get them the most worked up (think feuding family members!). So if you're feeling uneasy for any of the following reasons, we've got your back, sister. Most brides want to look their best on their big day, which can definitely trigger pre-wedding jitters, points out Shafonne Myers, wedding planner and founder of Pretty Pear Bride. "Making sure your dress fits perfectly, that your hair and makeup look amazing, and for some, especially plus-size and curvy brides, it can be a bit more intense. If you're feeling self-conscious about your body though, no matter what your size, keep in mind that your soon-to-be mate is marrying you for a reason and that's because you look fantastic inside and out." Whether you're deathly afraid of a downpour on your big day or seriously stressed out about less than perfect temps, obsessively checking the weather isn't going to help. If anything, it's just going to make you that much more anxious. So don't look at it, suggests associate planner and event designer at Pure Luxe Bride, Blake Bush. "The weather changes constantly and is a worry you truly can't control. Discuss a rain plan with your planner so you know exactly what will need to be done in advance," she says. Believe it or not, not every bride (or groom) enjoys being in the spotlight. And for those that are shy or typically avoid having others shower them with attention, the thought of getting hitched can cause a ton of anxiety, notes Greg Jenkins, founder of Bravo Productions. "Breathe and find things that will make you calm going into the day and push ahead," he recommends. "Remember that the people attending your function are there to support your happiness." Money woes have you feeling frazzled leading up to your big day? Steer clear of any cash-related concerns by setting an initial budget and sticking to it. "Decide what you must have and what you can live without so there aren't any surprise costs when the wedding approaches," advises Bush. In particular, divorced parents! "As one of my brides put it, way too many members of my family in the same place at once," says Lynn Jawitz, owner of Florisan Wedding and Event Design in NYC. To calm any pre-wedding jitters, she suggests meeting with each of the parties early on in the process and outlining what is to be expected of them in terms of behavior (i.e. whom they will take photos with, whom they will be standing next to, etc.). "This should all be fleshed out well before the day, and an expressed agreement agreed to between all of the parties." According to Sandy Malone, owner of Weddings in Vieques, the most common cause of pre-wedding jitters is what remains on the bride's to-do list in the month leading up to the wedding. "If she's DIYing her big day, she's going to be freaking out about how much is left to do and whether things will all work out or not. On the other hand, if she's got a planner but hasn't kept up with her deadlines for the guests' dinner orders, the DJ playlist or even writing her vows, these things will cause anxiety that is often misplaced." Malone's solution? Stick to a schedule and get going! After you've spent an entire year plus planning your day, sweating the details is hard not to do for so many brides. At some point, however, you've got to let go of control and allow others to take the reins in executing your function, points out Jenkins. "Delegate at the onset of planning your nuptials and reception, knowing you cannot play 'wedding planner' at your own event. And remind yourself that whatever happens is a small glitch in the grand scheme of celebrating a life together with your spouse." It's finally official: George Clooney and Amal Alamuddin are married! Capping off a wildly romantic weekend in which they celebrated their bachelor and bachelorette parties in Venice, Italy, and hosted a grand ceremony and reception at the Aman Canal Grande hotel, the duo followed Italian laws today and had a civil ceremony in the Sala Degli Affreschi at Palazzo Ca' Loredan, a council building. According to Us Weekly, the A-list actor and his British barrister wife donned a gray suit and a cream-colored hat and pantsuit, respectively, for the official event. That outfit was a slight departure for Alamuddin, who reportedly wore an Oscar de la Renta wedding dress, according to WWD. Their mode of transportation wasn't too shabby, either: They took the same Amore boat they'd been using all weekend. Clooney's friend, former Rome Mayor Walter Veltroni performed the civil ceremony in addition to the Saturday ceremony. Another witness included Clooney's favorite taxi driver Alessandro Greco. With their marriage finally set in stone, the couple of nearly a year seemed happier than ever, according to Us. Clooney told the magazine he felt "very good" before smiling and nuzzling into his new wife's neck as they exited the Palazzo. It's no wonder they're so giddy — the weekend was filled with revelry among guests including Matt Damon and his wife Luciana, Bill Murray, John Krasinski and Emily Blunt, and Cindy Crawford and her husband Rande Gerber. Another high-profile guest was U2 frontman Bono, who joked around with People as he left Venice this morning. "Wedding? What wedding? I was at a bar mitzvah," he said, when asked how he enjoyed the weekend nuptials. "The party was great. It's still going on ... in some people's minds," he added, before mentioning the ceremony. "It was very emotional and lovely," he noted. FaceTime is the next best thing to being there when you and your fiancé are forced to live apart. When Stefany Alongo and Tony Fuger met at a mutual friend's wedding, the spark was instantaneous. They knew there was something worth exploring. Alas, she lived in Palm Beach and his home was in Milwaukee. The courtship, according to Stefany, involved lots of "virtual dates, flower deliveries, homemade gifts sent via USPS, and romantic rendezvous in our respective hometowns and in cities across the United States." Two years later Tony proposed. The engagement period created a new set of stressors: making the zillions of big and little decisions that go into planning a wedding as a team when you are 1,500 miles apart. This necessitated clear, constant and honest communication. Recalls Stefany, "On a weekly basis we discussed our expectations for the wedding. For major vendor meetings Tony joined us via FaceTime." She finishes, "He arrived a week before the wedding so we could get our license and finish the last minute details together." Limit wedding planning conversations: Clearly, it's hard enough to schedule schmooze time when you live in different time zones. Staying connected becomes that much more difficult when most if not all of your precious contact revolves around choosing menus and devising seating plans. Instead, do fun activities together virtually — watch a movie on Netflix or cook the same recipe at the same time. Have real face time versus FaceTime as often as possible: Technology is wonderful. However, especially when so much of your energy is focused on the upcoming big day, you need to refuel and reconnect by spending time together in the flesh. Delegate: Part of teamwork is picking tasks that play to your different strengths and weaknesses. If he's the better DJ let him plan the wedding song playlist while you take care of the wedding registry. Read more: Brad Pitt on His Marriage to Angelina Jolie: "It's More Than Just a Title"
Lauren Conrad is loving life! She just married her dream man, William Tell, in an adorable, apple-themed affair, and now they're indulging in their romance on an extra-special Italian honeymoon according to her Instagram feed. Conrad used her masterful photography skills to show off her honeymoon's locale. With an Italian phrasebook in the foreground of the photo (below) and a blurred Mediterranean beach scene in the back, L.C. coyly captioned the shot: "How do you say 'I may never come home?'" Just before that she also posted a shot (below) of a carefully-curated set of rocks in the shape of a heart, which we can only assume was also found on the Mediterranean coast. The Sicilian sand isn't the only thing the brand-new Mrs. Tell is enjoying on her honeymoon: The MTV-alum-turned-fashion-designer-and-lifestyle-guru also admitted on her Instagram to starting a new diet — pizza and red wine! "Post wedding diet," she wrote next to a cute snap of herself holding up a pie and sipping a glass of red wine (above). See more: Why Did Whitney Port Miss Lauren Conrad's Wedding? She definitely deserves to indulge after her big day at a winery in Santa Ynez, California. After all, the Paper Crown designer rocked two very form-fitting wedding dresses courtesy of Badgley Mischka and Monique Lhuillier. And while we're sure their honeymoon eats are quite scrumptious, it sounds like the Tells' wedding was quite the culinary feat! Besides the 50 hand-made apple pies, guests and the newlyweds also noshed on black striped bass, Tuscan roasted chicken, and beef tenderloin. Let's not forget the mini grilled cheese and chicken and waffles they were served during the after party. What a way to celebrate! Read more: Go Inside Lauren Conrad's Italian Honeymoon! It was a complete coincidence that brought Melanie York and Craig Germano together in 2008. Melanie was living in Columbus, Georgia, and Craig was merely passing through during his move from Florida to New York City. A mutual friend of theirs, who'd attended West Point with Craig, was having a party, and both Craig and Melanie were there. "I thought he was cute," she says, "so I obviously avoided him for most of the night!" But Craig was persistent, and managed to get Melanie to talk to him — and they haven't stopped since. After a few months of phone calls, a first date in Atlanta, and moves to Florida, New York, and Washington, D.C., Craig and Melanie decided they needed a vacation and headed to Hawaii to visit some friends for a few weeks — and Melanie started to get suspicious. A week into their trip, the pair woke up at the crack of dawn to drive the road to Hana. Just as Melanie was ready to head home, Craig pulled over and they walked down to a church overlooking the water and proposed. "I was so excited," says Melanie, "but I looked sweaty and awful after a day of hiking and driving around. You're supposed to look beautiful and smell nice when you get engaged!" Melanie's always loved Charleston, so when she and Craig started planning their wedding, she made it her goal to make him fall in love with the city, too. Her plan worked, and the couple wed on December 5th, 2013, at Trinity United Methodist Church, then celebrated downtown at Market Pavilion Hotel, all photographed by Christophe Photo. Melanie tried on every style of gown she could find, from a poufy ballgown to a bohemian slip style, before landing on "the one." She was sold when she tried on the Georgina gown by Vera Wang. 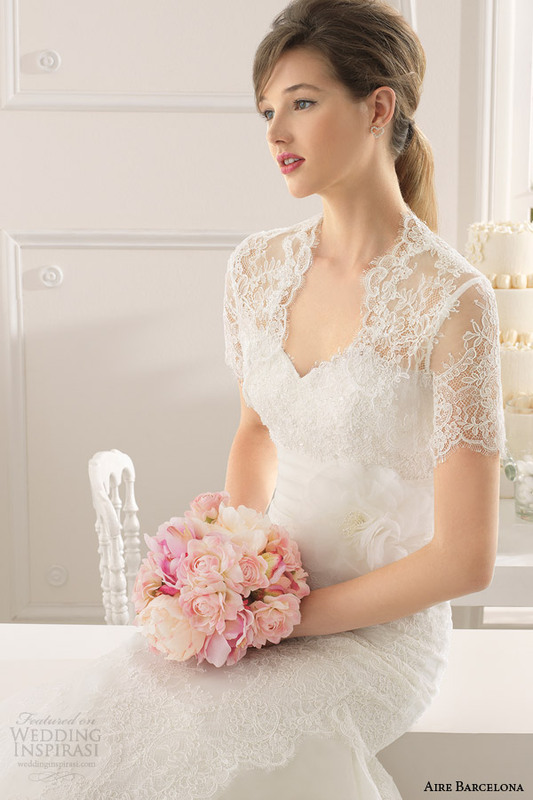 "I loved the modern, layered skirt, but that the lace on the bodice gave it a traditional, southern feel," says Melanie. She paired the gown with a pair of Kate Spade shoes, pearl earrings from her mother-in-law, and a necklace from her husband. The bride's father walked her down the aisle. "I was so nervous, I thought I might faint, so I couldn't help but walk quickly," she says. "My father turned to me and said, 'Slow down, you don't want to run down the aisle. He's not going anywhere.'" The couple did interviews with their reverend, both together and individually, to personalize their ceremony. "He included some detailed about our relationship, like Craig's George Bush impression and my random collection of books, to make it more 'us' and make everyone laugh," say Melanie. "We love the food, the culture, and the people of Charleston," says Melanie, "and knew it would be the perfect spot for a wedding!" The couple fell in love with Market Pavilion Hotel because of the classic décor and the intimate ballroom. "It's on the smaller side," says the bride, "so it was perfect for us." Their other favorite detail? Getting to have cocktails at sunset on the roof, with a sprawling view of Charleston. After their first dance to "At Last" by Etta James (the first song Craig heard when he turned on the radio after meeting Melanie! ), the couple cut into their three-tiered cake, featuring marble cake with ganache and buttercream icing. Guests waved ribbon wands as the couple made their way out of the reception and into the elevator for a rooftop after party — that moved to Craig and Melanie's hotel room at 2 a.m. and didn't end until after four. "The hotel staff came up and asked our friends to go back to their rooms!" she laughs. The newlyweds unplugged for their honeymoon, heading to Palm Island in the Grenadines and enjoying a bungalow sans phone, computer, and TV. "It was so relaxing," says Melanie. While ferns may conjure images of lush and verdant forests and jungles, we have a feeling they're the next big thing in the weddings world. The leafy, emerald-green beauties are a great accent to your bouquets and centerpieces, but they are also showy and stunning enough to take center stage and stand on their own. Ferns come in a ton of different varieties and looks, from the feathery and delicate maidenhair ferns to the whimsical, curlicue-shaped fiddlehead variety. And, best of all, they're available all-year-round, though they're especially great for late-summer, fall, and winter weddings. Check out our favorite ways to incorporate beautiful ferns into your wedding. Bouquet of Ferns and White Flowers (above): This pretty emerald-and-cream bouquet combines a variety of lush ferns with ivory lisanthuses, garden roses, ranunculuses, and veronicas. Summery Fern Bouquet: This sweet arrangement would be perfect for an outdoor wedding. We love the combination of textured ferns with cheerful daisies, hydrangeas, and feverfew. 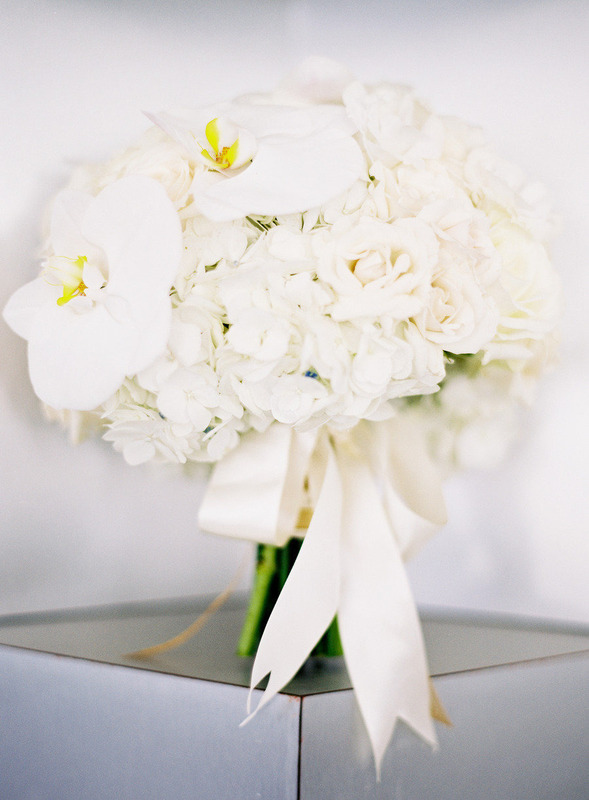 Green-and-White Bouquet: There is something so classic and pretty about simple shades of white and green. The emerald-green ferns add a touch of texture to balance out the creamy-white roses, lisanthuses, and pieris. 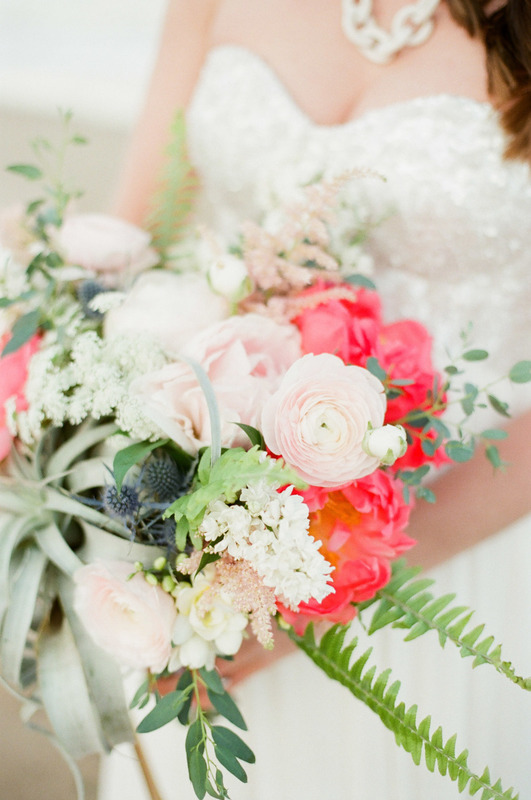 All-Greenery Bridal Bouquet: For a bold bride who wants anything but flowers in her bouquet, consider one filled with ferns, poppy pods, dianthus, fiddlehead ferns, celosia, and green hydrangeas like this newlywed's arrangement. Woodsy Bridal Bouquet: The long, delicate ferns give this bouquet by Honey & Poppies and wonderful woodland feel that's perfect for autumn or winter. Botanical Bridal Bouquet: This lush arrangement by florist JL Designs features delicate maidenhair ferns, bay leaf, pieris, double hellebores, anemones, veronicas, and astilbe and is tied with caramel-colored velvet ribbon. Now that fall is finally here, it looks like your wedding plans will literally all start to fall in place. Be careful though and remember to tie up any loose ends you've been putting off before October 4th, when Mercury goes retrograde, warns astrologer Lisa Barretta. Below, her full horoscopes for the week ahead. Lucky you! Venus just entered your seventh house of partnerships, which is sure to positively influence circumstances between you and your significant other. This is also a great time to make amends and settle any differences with family members. 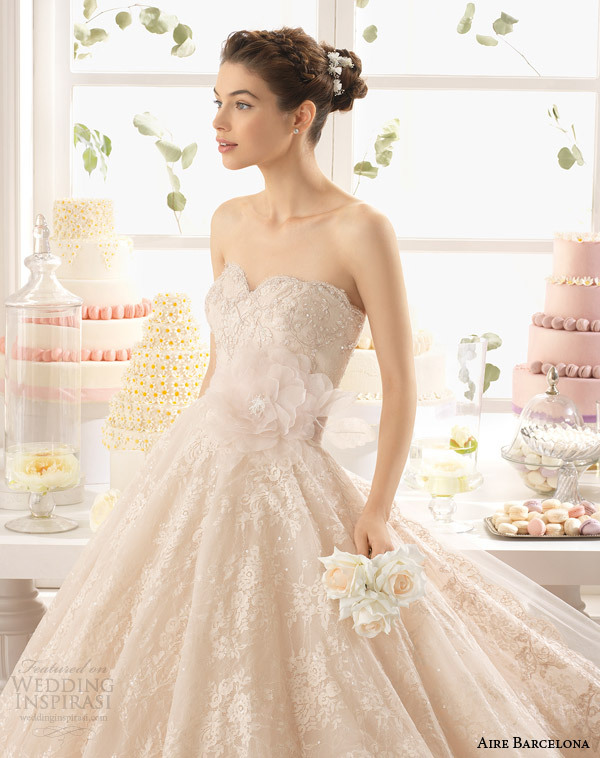 If your wedding is right around the corner, do get all your final fittings done before the 4th of October. Put your best foot forward this week, Taurus, because things may be shifting a bit for you on the job front. Don't let work issues shadow over your wedding plans, however. 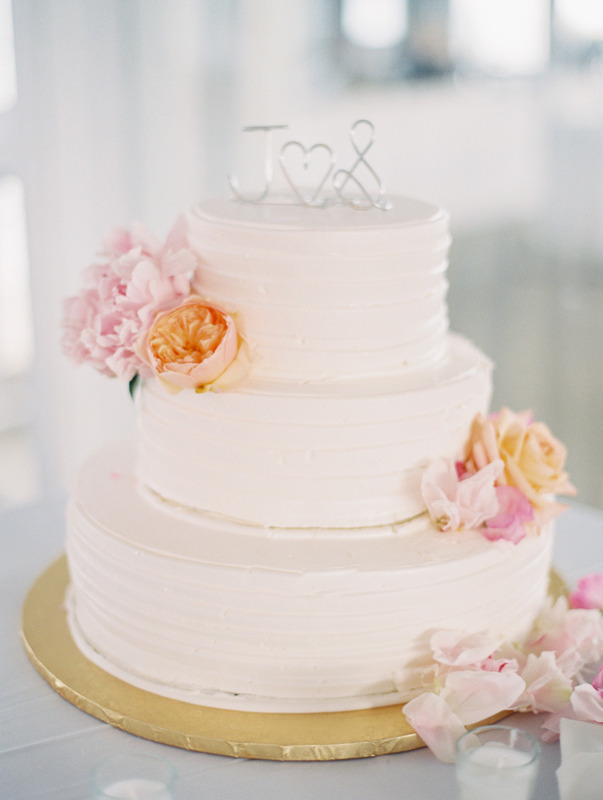 You take the cake when it comes to elegant planning, and speaking of cake, now is the perfect time to settle on what type of wedding cake you'd love to have at your reception. Venus transiting your 5th house of romance and entertainment definitely brings a rush of good times your way this week, Gemini. During these auspicious aspects you may stumble upon a good band or awesome DJ for your wedding. Lock them in before October 4th when Mercury goes retrograde. Thanks to the impending Mercury retrograde, issues with older family members may need to be addressed ASAP. Who is sitting next to who could present a little challenge so carefully plan your seating arrangements so it doesn't look like you're dealing with the "Hatfields and McCoys." With Venus transiting your third house of communications, along with Mercury getting ready to go retrograde, don't be surprised if you reconnect with a friend (or a few!) from the past this week. 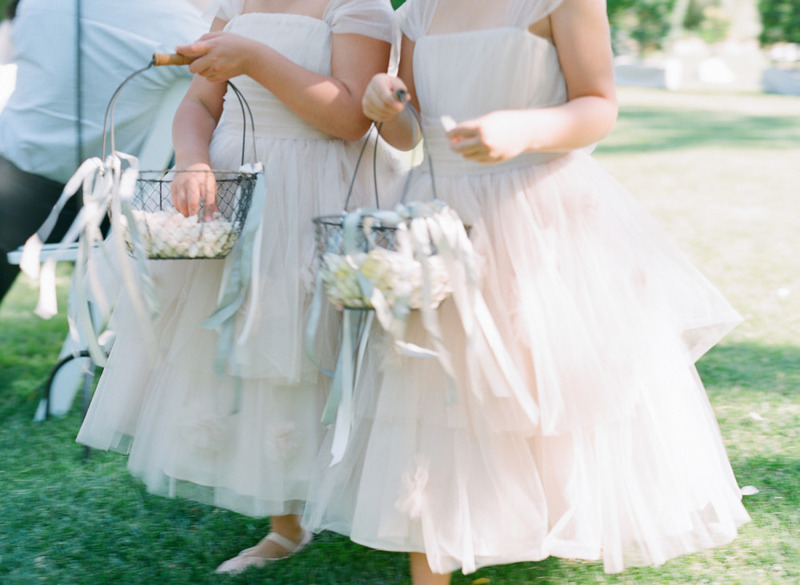 Gracious Leo gals may find their guest list growing as you pencil in several more guests for your big day. The caterer loves you right now! This week Venus moves into your second house of money and possessions, presenting you with some unexpected financial gains. You may very well receive a nice monetary gift or sensational shower present that's over the top in the best way possible. Take care of all important correspondences and "thank you" notes prior to the Mercury retrograde. Venus just moved into her home sign of Libra so there's no doubt that you may be looking and feeling your best this week. It's an ideal time to schedule your engagement photographs, along with locking in a photographer for your special day. Jupiter transiting your tenth house of career and reputation puts you in the limelight. Don't be shocked if an old flame from the past looks you up. How do you gently tell him or her that you're already spoken for? Savvy Scorpio girls are never at a loss for the right thing to say even during an awkward moment. Mars has been charging up your sign for the past two weeks so you may feel like you're being pulled in many different directions. Be careful with your engagement ring. Misplaced items are probably right under your nose so take a deep breath before you lose your cool. Have a glass of wine and chill out. Elegant simplicity works the best for you. 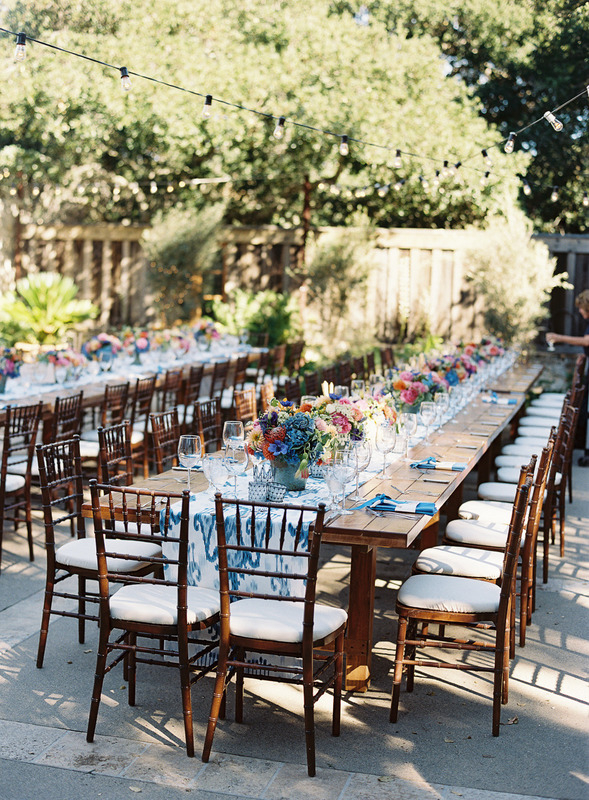 You may find yourself leaning more toward a smaller, more intimate wedding instead of a big bash. Pluto going direct in your sign helps you to reclaim your inner power and forge ahead with plans that make you happy. If you haven't already, try and settle on your venue before Mercury goes retrograde on October 4th. Jupiter transiting your seventh house of partnerships adds the perfect touch to your relationship. Open communication seals the friendship beneath the love and gives you the confidence you need in regards to your union. Long distance travel plans may hit a snag so double check reservations for out of town wedding guests and your honeymoon. Owner of Weddings in Vieques, a destination-wedding planning company off the coast of Puerto Rico, Sandy Malone has helped countless couples plan their big day since 2007. Here she shares ways to get your fiancé excited about wedding planning. There are some grooms out there who are fully-engaged in the wedding-planning process, but most guys are more concerned about the booze and the music than the wedding favors and the centerpieces — and that's okay. Cake tasting: Unless he doesn't have a sweet tooth, the groom should have fun tasting multiple flavors of cake with you. Even if you're having a destination wedding, you can taste cake at a hometown bakery and then use the desserts for your at-home party later. Plan the music together: Sometimes if the groom is a music-oriented guy, he'll even take the lead on this one. Just make sure to give him the list of songs you want to hear, too. Registering: Sure, you could probably do it online and save yourself some time. And he may not be jazzed about the shopping trip initially. But if you make an appointment with the store on a slow day (not a Saturday in holiday season), your groom will have too much fun with that zapper gun choosing presents. Let him zap away at anything and everything and tell him you'll edit it down later. Seating charts: The groom may care about which folks on his side are seated where, and those suggestions from him may just help you finish up whatever lingering seating-chart questions you had. Let him play with it and try not to argue with him about his decision unless you can't help it. The exhilaration and thrilling feeling of new found romance and love. That moment in life, that is rather indescribable— one must simplyexperience it and feel it. It’s all about that moment. George Clooney and Amal Alamuddin's Venetian Wedding: Get All the Details!